The Maine state police have said what many have thought for some time, but no one wanted to hear. They said that it was unlikely that missing toddler Ayla Reynolds will be found alive. 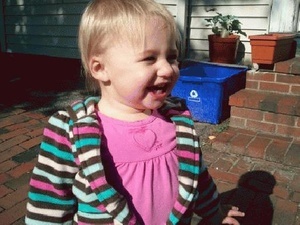 The 20 month old Ayla Reynolds went missing on December 17, 2011 as Ayala’s dad Justin DiPietro told police he had put her to bed the night before and the tot was gone the next morning. However, as reported at ABC News, after all this time it appears that there’s no evidence they’re any closer to finding her body or bringing charges against the person who’s responsible. Maine state police said yesterday it’s highly unlikely missing toddler Ayla Reynolds will be found alive, but authorities will continue the investigation and search for the little girl who disappeared in December from her father’s Waterville home. It was the first time police have said they doubt Ayla will be found alive. McCausland said officials met Tuesday to review the case and made the determination, then called Ayla’s parents, Trista Reynolds and Justin DiPietro, to inform them. Ayla’s mother, Trista Reynolds, and her father and mother, burst into tears while watching the news conference. “My worst nightmare has really come true. What hurts the most is I don’t even know where she’s at,” said Trista Reynolds, who noted that there can be no proper burial until Ayla’s body is found. Ron Reynolds said the family suffers every day that Ayla remains missing. “Why Ayla? She never bothered anybody. She never hurt anybody. Why hurt Ayla?” he said. This can’t be good, blood found inside the home of missing missing 20 month old Ayla Reynolds. 20 month old Ayla Reynolds has been missing since December 17, 2011 when she was reported missing by her father Justin DiPietro. Tha father told police he believed his daughter was snatched from her bedroom in his Waterville, Maine home. Days later following the search for missing Ayla Reynolds, law enforcement stated that the case had evolved from the search for a missing child to a “criminal investigation.” As reported at WCVB-TV in Boston, they know know why the case turned to a criminal investigation, as blood was reported to be found at the in the home. It is now being determined whose blood it is and how long it has been there. Multiple law enforcement sources have told McPhee that blood was found inside the home. Maine State Police have now confirmed blood was found in the basement of the home at 29 Violette Ave. Authorities said the crime lab is still working to determine whose blood it is, and how long it had been in the basement. Multiple law enforcement sources also told Team 5 Investigates that Reynolds’ father left the police station when he was shown crime scene photos of luminol-enhanced blood stains taken at the home. Two maternal relatives of missing toddler Ayla Reynolds have taken polygraph exams. Previously, Ayla’s mother, Trista Reynolds, took a polygraph exam January 18; however, was not able to complete it due to a medical condition. Also, Ayla’s father, Justin DiPietro, took a polygraph test as well DiPietro says police did not provide him with the results. The police say that is not the case and they did. Ayla’s uncle passed the exam, while Ayla’s grandmother was unable to complete it, according to aylareynolds.com. In an interview with the Morning Sentinel, Becca Hanson, Ayla’s grandmother, declined to discuss the exam’s specific questions, but said she told the polygraph examiner she had nothing to do with 21-month-old toddler’s disappearance. The exam was administered Friday by Maine State Police at Cumberland County Jail in Portland, she said, but the polygraph administrator couldn’t conclude the exam because Hanson’s daily medications interfered with the results. Hanson takes “muscle relaxers, pain-killers, depression medication and an antibiotic,” she said. For more updates and to discuss the case of missing Ayla Reynolds, go to Scared Monkeys Missing Persons Forum: Ayla Reynolds. A new twist has just been presented in the case of missing 20 month old Ayla Reynolds in Waterville, Maine.The toddler has been missing since December 17, 2011; however, according to an ABC News report, Trista Reynolds, the mother of missing Ayla Reynolds, filed to receive full custody of the toddler prior to her disappearance. The mother of the Maine baby who went missing from her crib revealed she had filed to receive full custody of the girl just prior to her disappearance from her father’s home. Trista Reynolds says she filed paperwork Thursday to receive full custody of her daughter Ayla Bell Reynolds — one day before the tot went missing — but says she had not told the girl’s father. “Her father had no idea. He didn’t know I went to file … he’ll know now, but I never told him and no one told him,” she said. Although it has been reported that the parents of missing Ayla Reynolds are coopering with authorities, there appears to be a bit of dissension between the two. The parents of Ayla are separated and appear to have not much contact with each other. Justin DiPietro lives separately from Trista Reynolds, who according to police has no permanent address, and the two share custody of their daughter. Trista Reynolds, says she has not spoken to him since their daughter disappeared. Something just seems a bit odd that this toddler would have just wondered away. One would suspect that she would have already been found if that were the case. 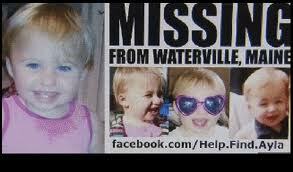 20 month old Ayla Reynolds has been missing since Saturday morning, December 17, 2011 in Waterville, Maine. Ayla was last seen sleeping in her bed at about 10 PM Friday night. Her father, Justin Dipietro, reported her missing Saturday morning when he said he found an empty bed. Waterville police believe that it is possible that Ayla Reynolds let herself out of the house and simply walked away. Or the child was abducted. The child lives at 29 Violette Ave., off Cool Street. She was last seen wearing green, one-piece pajamas with polka dots and the words “Daddy’s Princess” on them. She is 2 feet, 9 inches tall and weighs approximately 30 pounds. Presently police are conducting searches for the missing toddler. The investigation into the disappearance of Ayla Reynolds involves local police, state police, wardens and the FBI. So far no AMBER Alert has been issued as authorities state that the case does not meet the criteria. How insane, any missing child case should be an AMBER ALERT! Note: The missing toddlers parents do not live together. Ayla lives with her father, Justin Dipietro, aand her mother, Trista Reynolds, lives in Portland , although she does not have a permanent address. If you have any information on where she might be, you are asked to call Waterville Police at 207-680-4700. UPDATE I: National center for Missing and Exploited Children: Ayla Reynolds. Police Chief Joseph Massey said investigators have talked with Ayla Reynolds’ parents and extended family members, and that everyone is cooperating with the investigation. It is hard to believe that if the child just wandered off that she would not have been found. How far could a 20 month old get in the time she was missing?